I have been wanting to replace the little secretary desk by our front door for a long time. I knew I probably wanted a book case and had my eye out for one that was just the right size. Ding-ding-ding! We have a winner! 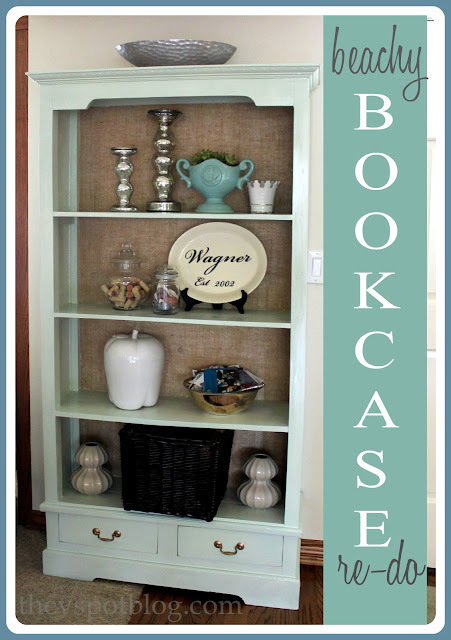 I love how this beachy bookcase makeover turned out! Last month I went to Habitat ReStore with Barbara from Chase the Star and along with the lamps that we bought to re-do, I scored this solid guy for a mere $49. Pretty ugly, right? He was pretty solid though, and that’s the important part. I had to spackle holes and caulk big gaps, then sand the whole thing pretty well to smooth it all out. I decided to spray paint the whole thing because I’m pretty lazy, and the thought of getting in all of those corners with a paintbrush got me all twisty. 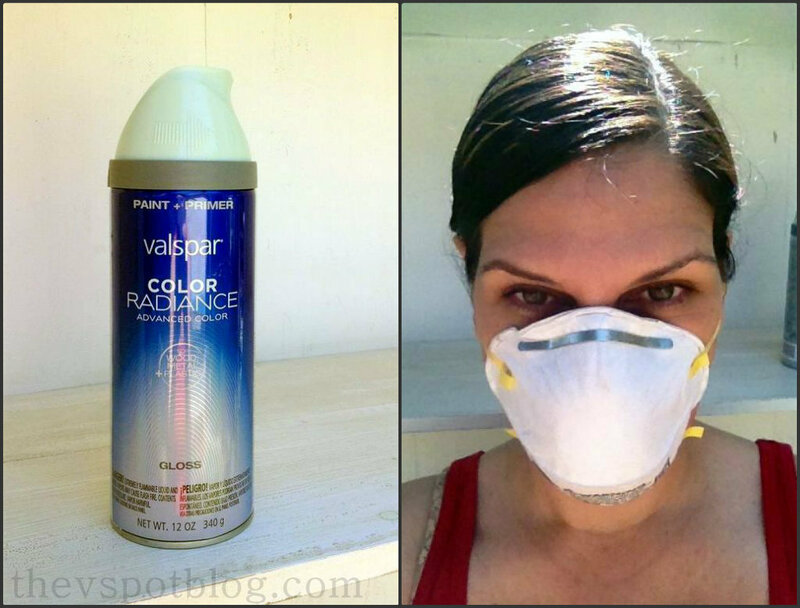 I used a paint and primer combo and eliminated an extra step. I let the bookcase sit and really “cure” for a day or two before I put the burlap backing behind the shelves. I rolled the burlap out on the floor to ensure that I cut it to the proper width and then proceeded to measure the space between the shelves and cut the individual pieces. Adhering the burlap is easiest if you lay the bookcase down on its back. I covered the back of the case with a nice, fairly thick coating of Matte Mod Podge and then gently pressed the burlap into it. A thicker layer of the Mod Podge allowed me to sort of “float the fabric into the exact position I wanted. Using matte (as opposed to gloss) ensured that the burlap retained its texture and color. Once dry, I trimmed any excess fabric with a utility knife. 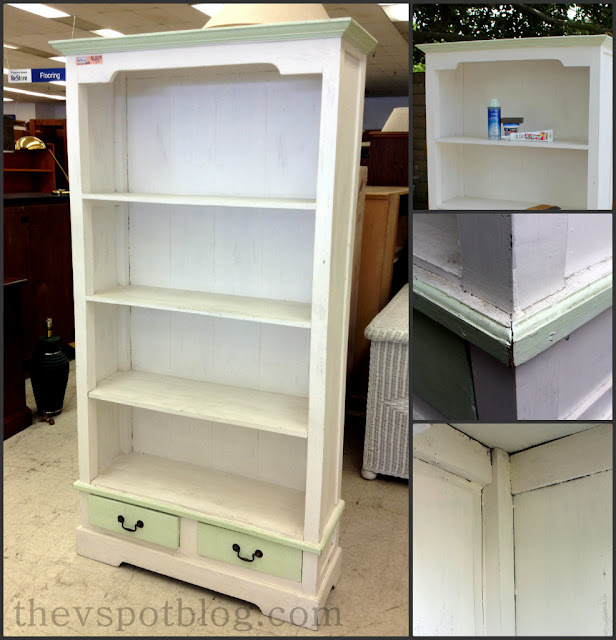 I had plans to antique this, or add nailhead trim or some other embellishment… then I ran out of steam. The more I looked at this, the more I decided I liked the simplicity of the beachy vibe the color and fabric created. All done, then. I am sure at some point, I will get a wild hair and decide to mess with it a little more, but for now I am satisfied to just keep shifting items around on the shelves and play with it that way. 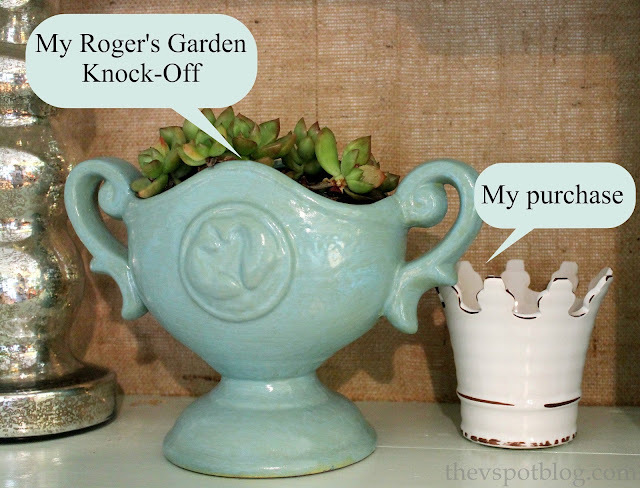 I am still loving my knock off version of their blue pottery, but I am also happy I picked up this little crown shaped flower pot. I don’t know why I like it so much, but I do! Now I have a place to put them both! So for $49, four cans of spray paint and a little burlap, I think I did alright. Do you have any furniture projects in the works? I love the way your bookcase turned out with the burlap backing! Great idea! I bet that piece was from The Great Indoors! I have fours pieces from there and it looks just like them. I liked the crappy-shabby construction. LOL. It sure looks wonderful now and I love the burlap backing 😉 It's gorge! I love the burlap backing – what a great idea! 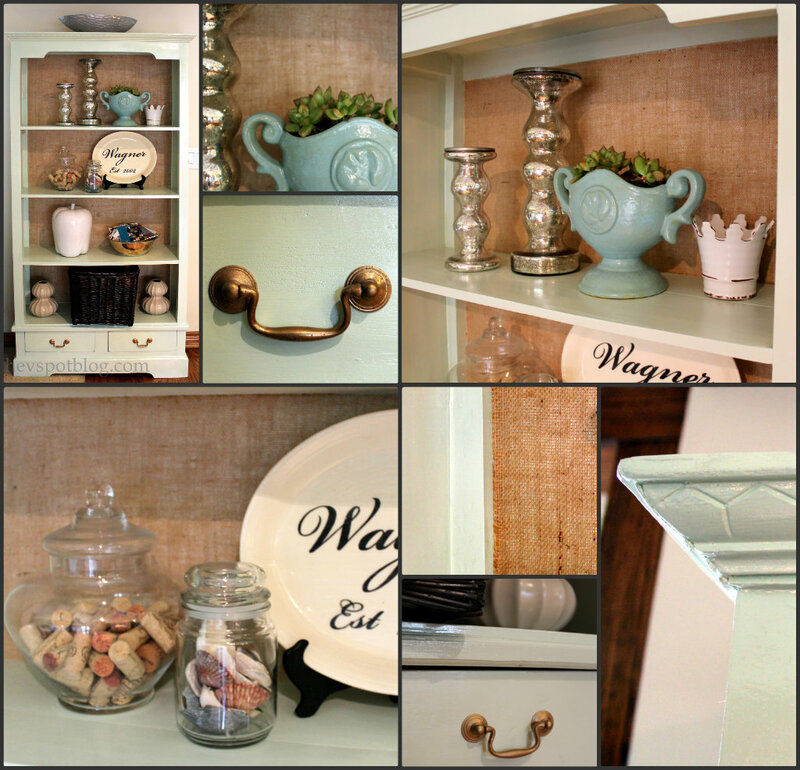 I really need to go to to a Habitat ReStore soon! I am loving this project, and the burlap back! What a great idea! Pinning this. By the way, I have a friend that lives down south, on a visit a couple of years ago, she took me to Rogers Garden. We were there forever. I am looking at a little bowl I bought there that resides in my favorite book case. Good thing I can't just hop in my car and go there. I could just grab my pillow, a blanket , and find a corner of that store to live in.